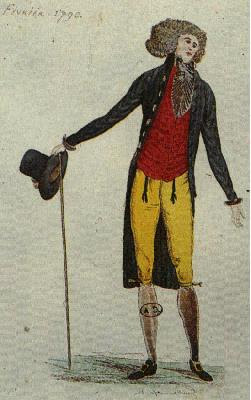 During the 1780s, a new style of hat emerged in France and England to supplant the ubiquitous tricorn: the early top hat. 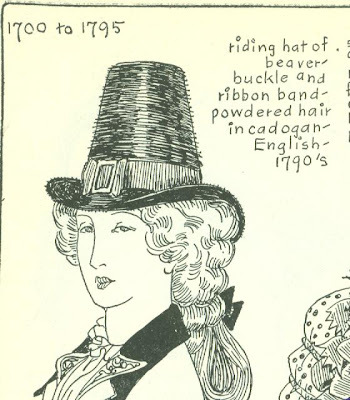 These illustrations were taken from one of my favorite books EVER, 'The Mode in Hats and Headdress' by R. Turner Wilcox, recently republished by Dover Press. 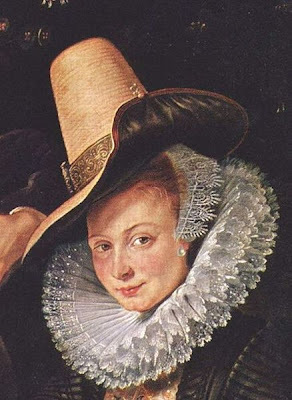 Sometimes called a Postilion (after 'post-boys', or carriage drivers, with whom they were popular), it was a narrow-brimmed variation on the 17th century wide-brimmed tall hat made famous in paintings by various Dutch masters, such as this portrait by Paul Rubens. It's taken from the book 'Old English Costumes Selected from the Collection of Mr. Talbot Hughes; A Sequence of Fashions Through the 18th and 19th Centuries', published by the Victoria and Albert Museum in 1908. 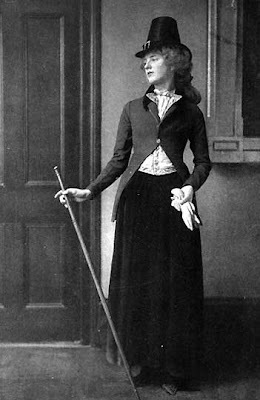 The wearing of antique clothing by live models is now verboten in museum circles, because of damaging stress placed on the garments in motion, so the photo shoot for this book may have been one of the last times these clothes were worn by actual people. As much as I understand and agree with the museum ethics that require that they're not worn by people, I have to admit that the graceful effect of seeing a live person in them can't be duplicated by costumes mounted on mannequins. 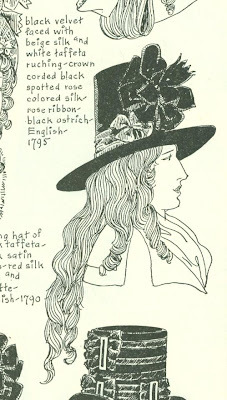 The early top hat was worn by men as well as women. 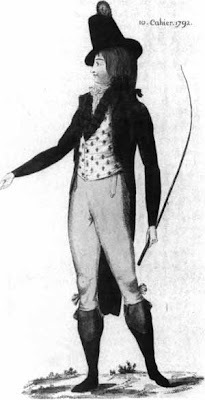 As you can see, the 18th century top hat was sometimes slightly conical, and other times straight-sided, but always of a similar height. 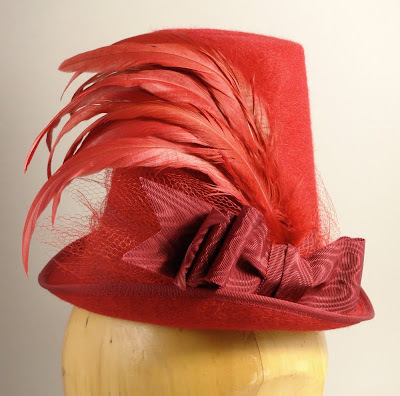 Like much of 1780s high style, it began as a fringe fashion of the aristocracy but was soon adopted as a symbol of revolutionary fervor and plebeian patriotism during the French Revolution and into the 1790s. 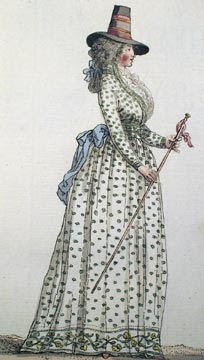 Here are some photos from the French fashion magazine Journal de la Mode et du Goût, published in 1790-1793. During the years following the Revolution, this magazine walked a fine line, politically, by showcasing both revolutionary and aristocratic fashions, until it was finally shut down during the Reign of Terror. 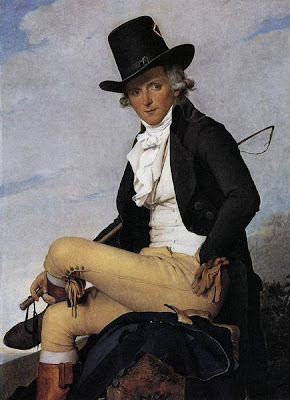 During this dark period, all fashion was seen as suspiciously redolent of upper-class luxury and therefore rejected, even persecuted, by those in power as well as the masses. Ironically, the Revolution, which was supposedly initiated to assist the common worker, put untold thousands out of work as the textile and garment industries in France were starved out of business by the death or defection of the rich, while those left standing were afraid to buy the kind of goods that would keep France's most important industries going. Such an un-French state of affairs couldn't last for long, though, and the French fashion industry started to rebuild itself in the latter part of the decade, reaching ascendancy again in the 19th century. 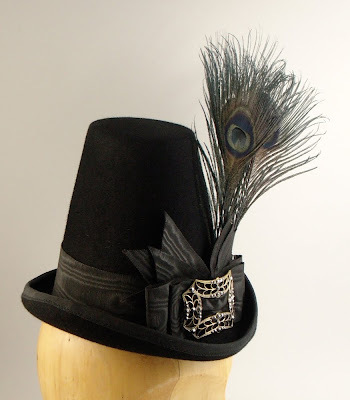 This form of top hat remained popular through the early 19th century, until the beginning of the Romantic Period (starting about 1815), when it began to slowly evolve into the shorter top hat shape we're more familiar with today. Being a history geek, when I decided to have some custom hats blocks made last fall, I knew I needed to have a Regency Top Hat block. 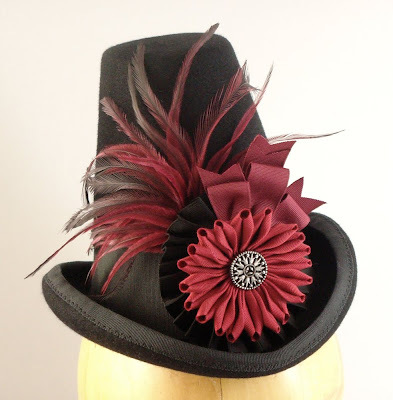 I had decided to have some mini blocks made, slightly smaller than 'normal' size, and had a tall top hat crown made that fits with either a tightly rolled brim (like a derby or a later 19th century top hat), or a slightly flatter narrow brim. Here's how they turned out. 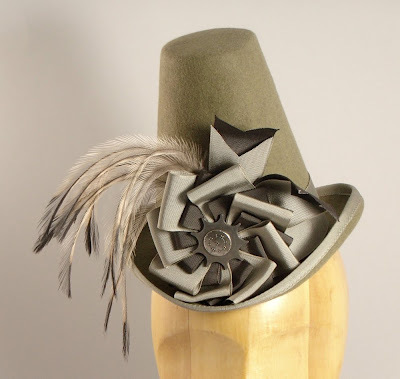 These are lovely hats. How tall are the crowns? 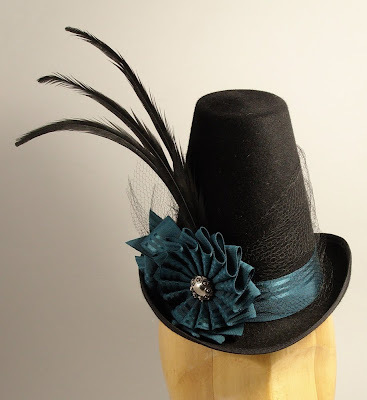 I'm trying to replicate the blue and white bonnet varient in a straw version but am unsure how tall to make it. Your guess is as good as mine. I have only made them in this mini size. I would estimate the height of your head, then compare that to the proportions of the head / hat ratio in the picture (I would say about 1:1), and take it from there.